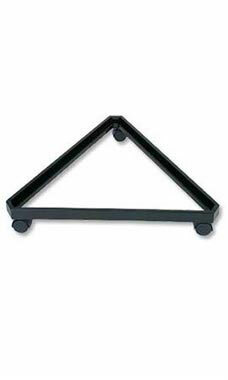 Create an instant stand alone triangular unit with our Black Triangle Grid Base with Casters. Triangle Grid bases can be used with existing 3” on center wire grid panels. Wire grid panels rest on top of a triangle base that turns regular wire grid panels into a portable display that rotates. Display fixtures can be added to enable merchandise to be seen on all three sides. Each Triangle Grid Base is 24"L x 24”W x 24”D. Additional wire grid fixtures and shelving can be added to complete your display.